Mason’s Creations is now approaching its 30th Anniversary of providing quality stained glass art and customer service through its many phases of garden art, lamp fixtures, and more, as any of these customers and many more that you could locate will tell you, and I hope that you will be one too. Pictures are less blurry if you click on to view. 1993, Donna Kozinski, purchasing an early lamp direct from the artist at Spiral Shop Gallery in Marlboro, VT while visiting from Texas. 1994, Harold Makepeace presenting commissioned stained glass portrait to Edna Earl, Sanford, NC. 1994, stained glass renditions of paintings by modern Italian impressionist Eliano Fantuzzi, friend of Charles Edward Brooks, Zurich, Switzerland. 1994, one of a pair of freeform glass window pieces for Pink Flamingo Boutique, Brattleboro, VT.
1994, Falling Leaves window for Steve Dibner, San Fransisco, CA. “I write to give Mason Parker my highest recommendation. I have known Mason for over 25 years. We first met living in Vermont. I was on an excursion with family and visited The Spiral Shop indoor/outdoor interactive gallery that he co-created and founded. A magnificent surprise was his talent and gallery. My family spent many splendid hours there over the coming years appreciating his singular style and creative stature. People traveled from all over New England and New York to witness his spectacular artwork in a beautiful setting. The gallery is remembered today and was recently referenced as a Vermont Nouveau Standard in local artist publications. Most notable to to me is the exhilarating and loving reaction many people have to his art in my home. 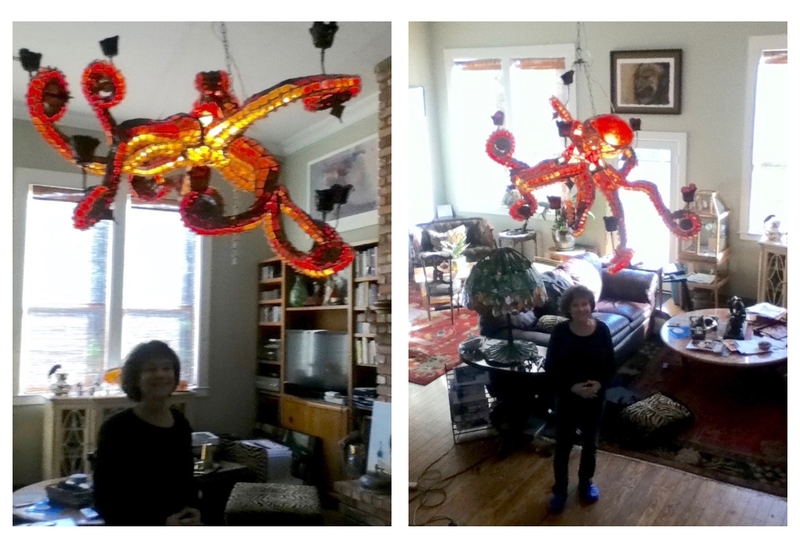 Mason commissioned several stain glass works and restorations for my historic homes. His “Blue Saturn with Love” is a celestial gem perfectly balanced in a mid century modern home design appreciated by many and highlighted in Homes of Distinction. 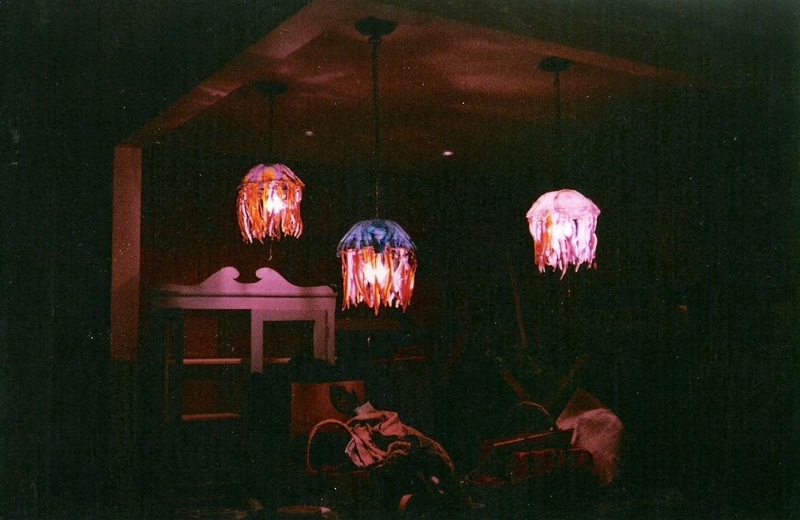 His Green Jellyfish Lamps were the perfect touch for a friend’s ocean home on Martha’s Vineyard adding much distinction. Withal, Mason is most personable and affable. He bears his interests lightly and the end result is free-flowing creative expansion. His interests are wide and varied. Efficient, friendly and surprisingly willing and able to tailor many needs with gifted focus and quality, Mason will always have a loving and appreciative following. If you have any questions, please contact me. I shall be happy to speak with you. Our best to Mason Parker. 1998, freeform maple leaf lamp for Donna Lish, Morristown, NJ. “I first became acquainted with MASON PARKER’S CREATIONS almost 20 years ago where his colorful and whimsical work on display at a crafts fair in Vermont caught my eye. 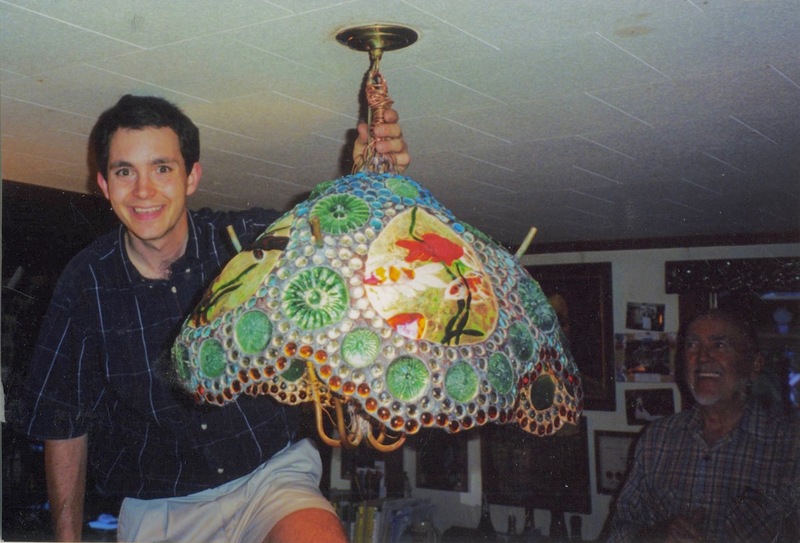 I asked him if he could make me three hanging lamps for my brownstone apartment in Brooklyn which he did – they came out even better than I had hoped and I still enjoy them every day I walk into my kitchen! 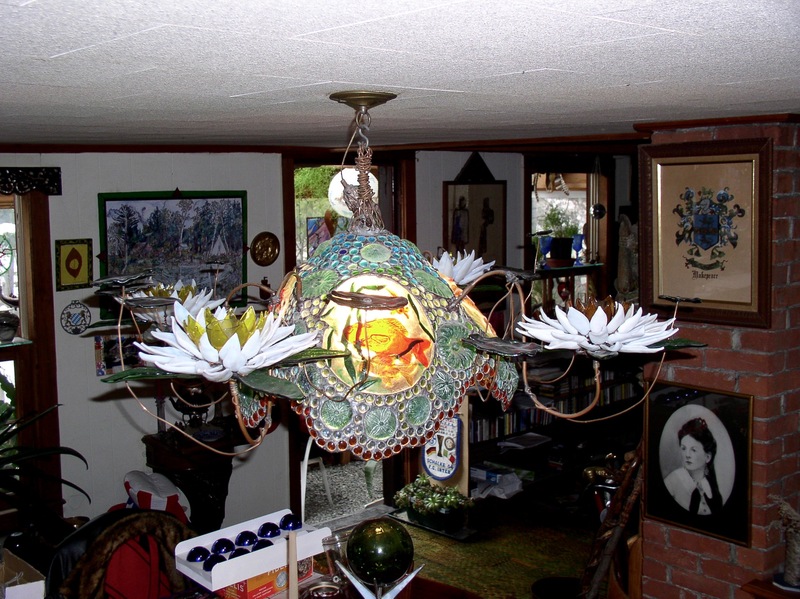 I then commissioned him to create a larger “chandelier” for my entry foyer and we discussed the idea of a “garden of Eden” of some sort, or a big ‘tree” image that held within it all kinds of flora and fauna. 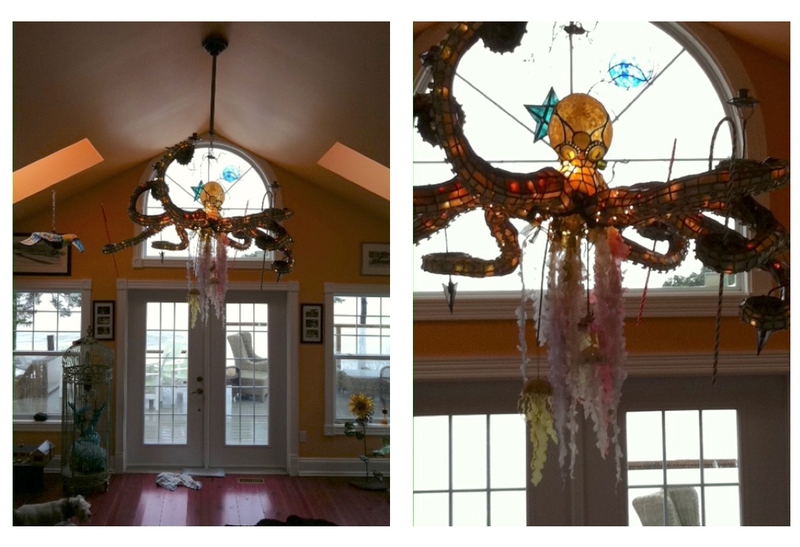 He created a beautiful, wild, organic lighting fixture that he drove done to Brooklyn himself and hand delivered and which still delights everyone who walks in my front door. 2001, Forest Window Triptych windows at Liz Tucker’s residence, somewhere in the midwest. “We purchased our original “mushroom” in an Art Gallery while vacationing in Provincetown. After a few years in our garden, it was inadvertently knocked over and broke. I was able to track down Mason on the internet, and he was more than happy to make another for us with a more substantial mounting pole. Mason also offered to repair our broken piece as well! We shipped the pieces to him, and he did a great job putting Humpty Dumpty back together again! 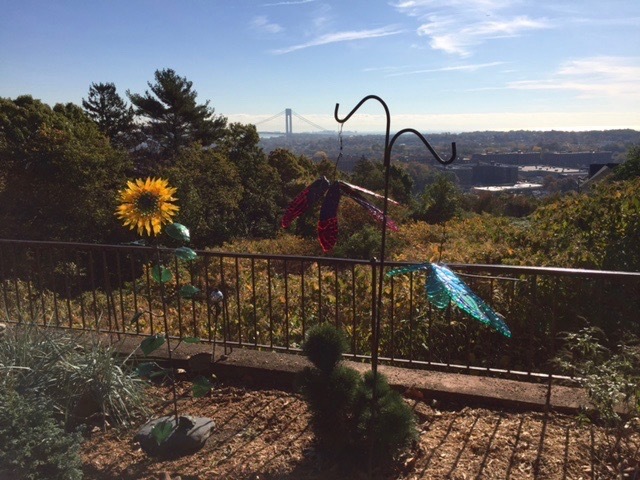 2016, sunflowers and large damselflies at Janice Ellison residence, overlooking Verranazo Bridge, NY.